Nintendo games have a whole ton of beta content and other unused stuff lying around in the files. But did you know Mario Kart Wii was meant to have more characters? That Isle Delfino had a train system? Or that Mario All Stars was meant to just edit the original graphics? I suspect not, so keep reading for ten interesting beta things found in Mario games! 1. Play Mario Kart Get Dizzy? First of all, an interesting beta element from Mario Kart Super Circuit. Now admittedly, this game is filled to the brim with interesting elements and things that never got into the final product. You’ve got redrawn versions of all the obstacles and scenery from Super Mario Kart (despite how it was removed from the remade tracks), you’ve got at least four items that were cut before the game came out and at one point, every single battle arena from Super Mario Kart was meant to be unlockable in this game as well. So, would these have made Mario Kart even more interesting than it already is? Yeah. In the actual finished game the only thing close to an introduction is a minor cut scene showing some of the stage, but in the beta it was even meant to have an episode select screen and all! As you may have recognised, this is the text style used at the top of the mission select screen found prior to any ‘real’ level in the game, as if Nintendo was planning to make it a full eight shine sprite area with multiple missions to complete. Unfortunately the idea was scrapped, giving the final level the most anticlimatic intro in history and making the finale one hell of a disappointment in general. Now, here’s an interesting beta feature from Mario Kart 64. You know how in some games there are giant levels where enemies and objects are far bigger than they should be? Like Tiny Huge Island, Big Island and the Macro Zone? Well apparently a bonus option in Mario Kart 64 was meant to let you resize the tracks. So in other words, you could make everything (all walls, obstacles, objects, etc) taller by a certain value. 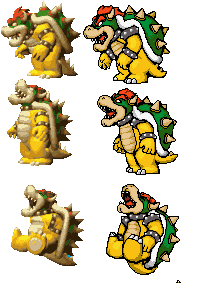 There’s no data for this in regards to the X and Z axises (aka making objects wider or longer), but can you imagine if something like this was featured in the final game and you could make the likes of Rainbow Road about 200% of the normal size? You could end up racing around massively scaled up versions of Mario Kart tracks, sort of like what would happen if they were built on Tiny Huge Island! Presumably it was either meant to be a boss in a scrapped ice level (maybe Snow Cap Galaxy was a full stage, or Freezy Flake Galaxy was a Mario Galaxy 1 thing?) or the Freezeflame boss in place of the rather forgettable Baron Brr. 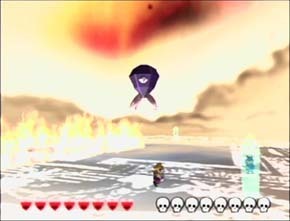 But at one time, the above thing was meant to be a Mario Galaxy boss. 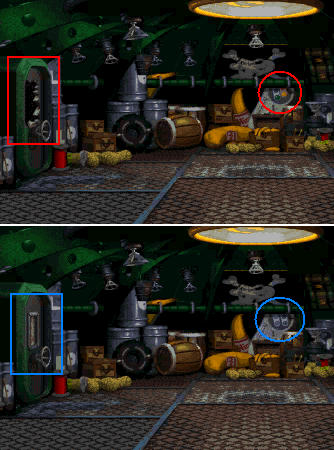 Here’s a really, really interesting (and difficult to spot) detail in Donkey Kong Country 2. Remember the arena used for fighting Kaptain K Rool the first time, the Flying Krock? Well in the European version, the door seems to have smashed in, yet it’s perfectly intact in the US version. It’s only a minor detail, but I guess it gives some pretty good evidence to how Diddy and Dixie managed to enter K Rool’s airship. Wonder why it was removed from the US version of the game? 6. Fighting Whacka in Battle! Remember how in the first three Paper Mario games you had this small creature called Whacka that you could hit with a hammer to get healing items? And how if you hit him enough he left and never returned, perhaps presumed dead? This is a Whacka. That Bump on his head looks like a donut hole. You probably shouldn’t have hit him so much. He looks a little peeved. I guess the game really was meant to punish Mario for animal cruelty at one point, that dude must have had a temper! In Donkey Kong Land 2, all boss battles have the K Rool battle theme (Crocodile Cacaphony) instead of the standard theme. But did you know the track wasn’t actually removed from the game and was actually redone in an eight bit chip tune like style? It’s not the only unused music in the series (Rocket Rush also has unused music in the ROM, as does I think Rambi Rumble), but it’s strange how this theme was even cut in the first place. I mean, Rocket Rush was obviously way, way beyond the technical capabilities of the Game Boy with the rocket barrel gimmick being pretty much impossible on an eight bit system, but the boss music? The bosses were mostly all included in the game, so why cut a perfectly good piece of music that would have fitted perfectly? At least, for Super Mario Bros 1. Remember how in the game all the graphics were redone and how the style used for Super Mario Bros 1 was very different to the original NES look? The bricks were replaced by grass, the castles got a new tileset, all that stuff? 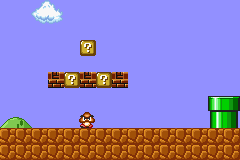 But as you may have figured, the redrawn tiles looked kind of ugly, eventually causing Nintendo to abandon the whole ‘translate SMB 1’s tiles to 16 bit’ idea and just draw them in the now familiar Super Mario All Stars style we all know and love. Trains may have been a divisive addition to the Zelda series based on their presence in Spirit Tracks, but it seems like that wasn’t the first time trains were meant to be added to a long running Nintendo series. Nope, apparently Super Mario Sunshine was meant to have a train based transit system used to transport Mario across the island. Pinna Park was accessible via train/on land rather than on an island at some point in time. Hotel Delfino was meant to be located in a different part of Sirena Beach or the area made bigger. Will you be riding with us today? Looks like Super Mario Sunshine was going to be a very, very different game before Miyamoto upended the tea table or the direction was changed in development. Can you imagine riding a train between Super Mario Sunshine’s levels? Mario Kart Wii may already have a fairly impressive character roster with a ton of choices, but did you know that originally there were meant to be many more playable characters in addition to the ones we got? Yeah, icons have been found depicting Paratroopa, Petey Piranha, Hammer Bro and a Mii Outfit C as playable characters! Considering that nearly every other character from Double Dash made a return, it does only seem logical that both Petey Piranha and Paratroopa would as well, right? But the existance of another Mii outfit and Hammer Bro is intriguing. Was Hammer Bro meant to be the next Mario mook to become playable? Because I’m sure he was also playable in Mario Party 8 around this point in time as well, so this would probably have been his intro in Mario spinoffs in general. And the new outfit, what’s that all about? It’s not in the same style as the existing ones, so was it originally meant to be some sort of outfit or costume like the character costumes from Mario Tennis Open? That would make sense, Outfit A is normal Mii, Outfit B is in Mario/Luigi dungarees and the like, maybe Outfit C is costumes based on Yoshi or DK or the like? Bur yes, Mario Kart Wii was meant to have quite a few more characters than it did. And heck, it’s a shame these weren’t in the final game, it would have made the roster nearly perfect in my opinion. Did you know any of this stuff? Random; Five More Interesting Facts You Didn’t Know about Mario Games!